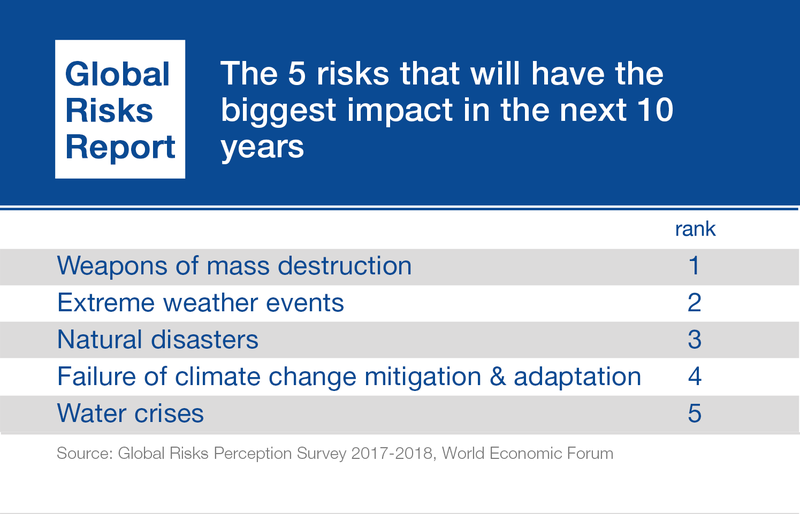 As 2018 starts with waves of extreme weather across the planet, it seems uncomfortably appropriate that environmental issues have once again dominated the list of the most urgent risks identified in the World Economic Forum’s annual assessment of global risks. The upper right quadrant of this chart from the Global Risks Report 2018 identifies the most dangerous threats to human well-being and safety – these are the risks perceived as being most likely to occur and as having the biggest impact on humans. 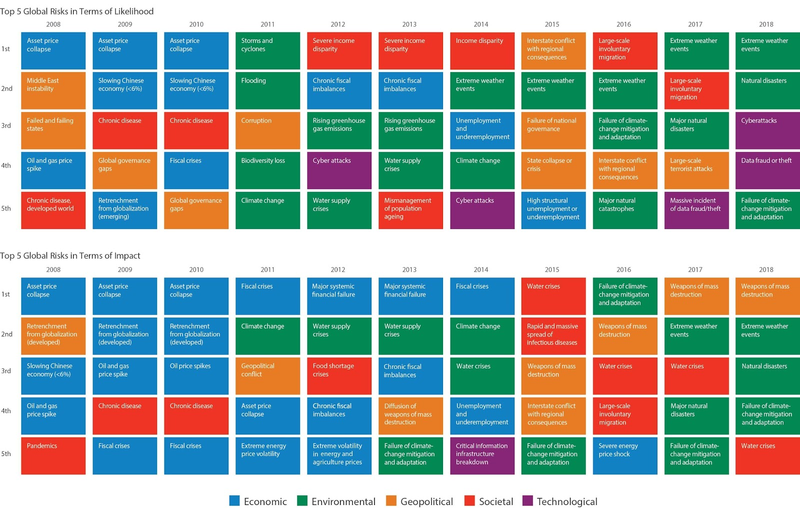 For the first time, all of the environment-related risks surveyed fall in this quadrant. Of course, mainstream awareness of the seriousness of environment-related risks is not new. For the past eight years, risks such as extreme weather, climate change, water crises and major biodiversity loss and ecosystem collapse have increasingly featured in the report’s lists of top risks. This time, however, the threat is personal. Environmental pollution is no longer just a global externality – to be dealt with by someone else at some other time. We are now internalizing environmental risks within our own bodies, often unwittingly and even in the richest countries in the world. For example, every year, around 8 million tonnes of plastic is added to the world’s oceans, where it is ingested by fish, birds, turtles and other marine life. It accumulates in the food chain and is now finding its way into humans. It now pervades both saltwater and freshwater resources. One study found that seafood eaters could be ingesting up to 11,000 pieces of microplastic every year. Another found microplastic in 83% of tap water samples around the world and 94% of samples in the US – on average 4.8 fibres per 500 millilitres. In addition to plastics, humans on every continent have ingested pesticide residues from honey, while many in cities are breathing toxic air. More than 90% of the world’s population live in areas with unsafe levels of air pollution. Doctors in Delhi, declared a public health emergency in November as air pollution exceeded 30 times the World Health Organization’s (WHO) recommended safe limits. The WHO also reported that environmental issues are responsible for more than a quarter of all deaths of children under five years of age (around 1.7 million per year), while the Lancet Commission found air, soil and water pollution causes an estimated 9 million premature deaths a year. It’s not just our health. Environmental issues also affect our wealth and prosperity. The Lancet Commission found pollution costs the global economy $4.6 trillion per year – around 6.2% of global economic output. Meanwhile, extreme weather has been wreaking havoc on our economies and societies. Well before the recent ‘bomb cyclone’ and deep freeze gripped North America while Australia sweltered in extreme heat, last year’s extreme weather had already had devastating consequences. Munich Re estimates total insured losses at $135 billion from natural catastrophes in 2017. Worryingly, there was a further $195 billion in uninsured losses. These costs are forecast to grow. In the US, a non-partisan government report found that climate change could cost US taxpayers up to an extra $35 billion per year by 2050. The latest human displacement data shows that around 24 million people were forced from their homes in 2016 as a result of storms and weather-related events. While some action is being taken, overall, the scale of action is woefully insufficient in the face of the severe, existential and well-publicized environmental threats humanity faces. There also seems to be an insidious disconnect between how we think about environmental and economic risks. 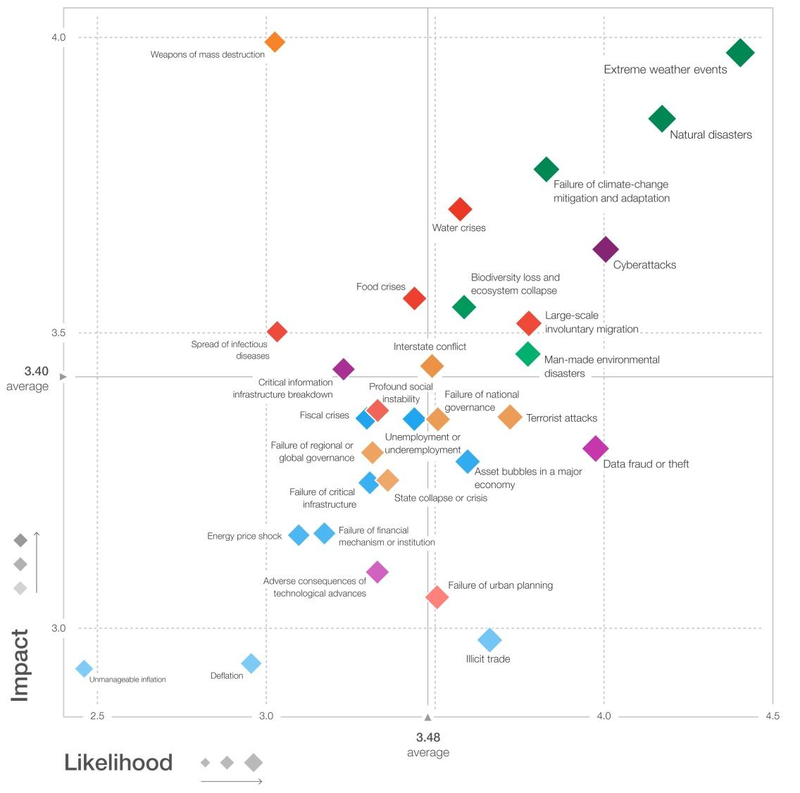 A closer look at Figure 1 shows that while the environmental risks are all found in the ‘high impact, high likelihood’ quadrant, many of the economic risks are clustered in the ‘low impact, low likelihood’ quadrant. This may be symptomatic of a broader – and problematic – mindsight. The lack of financial value historically placed on the environment and human health has led to these areas being treated separately from economic planning and investment. Taken as a whole, governments and businesses have, evidently, not taken adequate account of the causal relationship between environmental impacts and economic and societal prosperity, well-being and sustainability. In reality, however, these dimensions are deeply interconnected. For example, the risks of ‘extreme weather events’ and ‘major natural catastrophes’ are perceived as high impact, high likelihood. They can cause dramatic interruptions or damage to critical infrastructure – in Puerto Rico, more than three months after Hurricane Maria struck, 45% of electricity customers still do not have power. Yet the risk of ‘the failure/shortfall of critical infrastructure’ was perceived to be ‘low impact, low likelihood’. Similarly, the risk of ‘man-made environmental catastrophes’, which arguably include air pollution and climate change, are perceived to be ‘high impact, high likelihood’, while the risk of an ‘energy price shock to the global economy’ was perceived as ‘low impact, low likelihood’. This is despite the fact that the growth trajectory of electric vehicle sales (partly driven by policy responses to climate change and air pollution) has been forecast to displace oil demand by around 2 million barrels per day by 2025 – the same amount attributed to triggering the low oil prices and industry downturn of recent years. The displacement could be as high as 16 million barrels per day by 2040. With the world population forecast to increase to 9.7 billion people by 2050, the growing threat of environmental risks – and the perception they are disconnected from economic concerns – suggests there is a more fundamental and systemic challenge to be addressed. Cyber risk is a growing challenge. So how can we prepare? As humans and the planet internalize the economic externalities of the past 150 years and as the risks continue to mount, the prevailing economic assumptions and operating models may no longer be appropriate for the 21st century. Addressing these structural challenges will be a crucial first step to effectively managing the growing set of environment-related risks that the world faces. A second step will be to develop new platforms for cooperation that can accommodate the increasingly diverse group of stakeholders needed to solve these problems – from national governments to cities and states, businesses, technology experts and investors. Such collaborations are becoming more and more important in a world where values and policies between, and within, many nations and international actors seem to be diverging. It is becoming more complicated to address our shared environmental risks. If we fail to get this right, one thing is for certain: we cannot say we weren’t warned.